A picturesque thatched inn, The Three Horseshoes is nestled in an idyllic village just 3 miles from Cambridge city centre. Voted Cambridgeshire Dining Pub of the Year for 2018, the restaurant serves hearty, comforting dishes, fresh fish and plenty of options for vegetarians. Particular attention has been paid to preserving the traditional pub with its real fire and cosy corners. Dogs are welcome in the pub. Enjoy local real ales, cocktails and a wine list focused on the Languedoc-Roussillon. 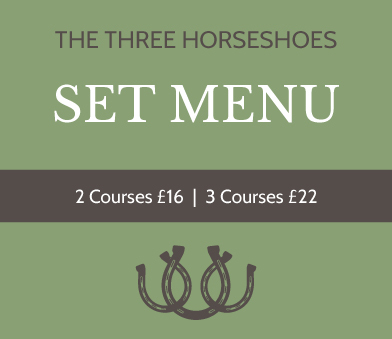 Since January 2018 The Three Horseshoes has entered an exciting new chapter as part of Cambscuisine, a local group of independent restaurants. The Three Horseshoes, Madingley, serves a great value set lunch during the week. Please take a look at the menu section of the website. Treat yourself to an Italian three-course feast… click here to view the menu. 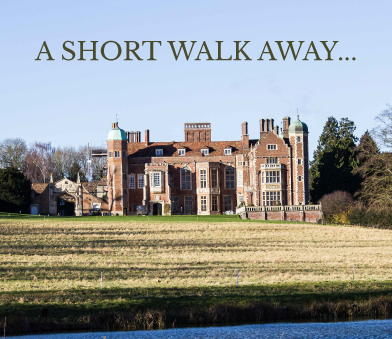 The extensive gardens of Madingley Hall are only a 5 minute walk away from The Three Horsehoes, making for the perfect stroll before or after Sunday lunch. The hall is also the key site in the University of Cambridge’s Institute of Continuing Education. Madingley is the home of Cambridge American Cemetery which contains the remains of 3,811 American war casualties. A new, 4,000-square-foot center visitor center opened in May 2014. Through interpretive exhibits that incorporate personal stories, photographs, films, and interactive displays, visitors will gain a better understanding of the Battle of the Atlantic, a critical campaign that contributed to the Allied victory in Europe during World War II. We are a passionate local business devoted to providing fresh, seasonal and where possible locally sourced food. The menu is keenly prepared, presented and served by a knowledgeable team. Please see our blackboards for fresh fish and seasonal specials. All fish is supplied by Marrfish from day boats and delivered fresh daily. These dishes change regularly and are from a sustainable source. We serve two real ales both from East Anglian breweries and two kegs beers, Nene Valley’s Release The Chimps and Adnams Blackshore Stout. Lagers on draft are Amstel, Moretti, and we have Symonds Cider. We also have a good selection of cocktails and mocktails. Where will we be seated? Please note that your reservation will be automatically assigned depending on the most suitable table for the required number of guests. As we serve the same menu throughout, there is no difference between bar area and restaurant tables when booking. If you wish to specify a certain area or table then please do so when booking or by replying to your confirmation e-mail. We will endeavour to meet all requests but cannot guarantee it. Can we just pop in for a drink? Of course! We’ve paid particular attention to preserving the village pub. Food can be served in the pub area and so it is a wonderful environment in which to just come and have a drink, a bite to eat and read the paper. Yes in the pub and pub garden but not in the restaurant. We even have dog biscuits available. Do we have a car park? Yes, with space for around 30 cars. There is plenty of car parking on the street should this be full. Please do not block neighbours into their drives when parking on the road. Yes we do, please give us a call or pop us an email to discuss further. We don’t but please call us since we know some local guest houses which should do the trick. One of our other venues, The Crown & Punchbowl in Horningsea, has nine delightful guest rooms.